2012 Weingut Leitz, Riesling Trocken, Rüdesheimer Berg Roseneck, Katerloch, VDP Grosse Lage, Rheingau Germany. The beautiful golden hued 2012 Leitz Rosie Trocken, a GG by another name, is drinking absolutely gorgeous with tons of fruit, mineral and extract in an ultra dry and crisp style with a hint of maturity and mouth feeling complexity. More open than the Schlossberg and Kaisersteinfels Crus the Rudesheimer Berg Roseneck shows expressive yellow peach, candid lemon peel, tropical notes, wilted roses and lime blossom along with elements of verbena, chamomile, faint petrol/flint, wet stone and green apple. The Rudesheimer Berg Roseneck cru sits above Rudesheim and the Rhein River on mostly reddish soils with lots of weathered slate it’s a site that gets plenty of sun and is very generous in flavors making for elegant and round wines, there’s more opulence here than it’s Berg siblings, but they always age well and have fine structures. With air a saline and savory side comes out to contrast against the fruity essences that bursts from the glass and the textural presence gives a serious palate impact, while the brisk acidity holds everything to together perfectly, this is a wonderful dry Riesling that thrills and is brilliant with cuisine in the same way as a Premier Cru Chablis, but with a more exotic personality. 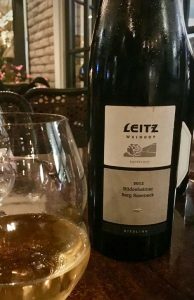 Leitz now labels this bottling a Grosses Gewachs under VDP rules and the 2015 and 2016 are current releases, I reviewed the 2015 about a year ago, still available to view here at grapelive.com and I rated it at 94+ Points, while the 2011 and 2012 might be hard to find they are great deals if you find them, especially this 2012 which continues to get better and impress more with age. Johannes Leitz’s latest releases are some of his best young wines across the board with something to love in each price class and style, from classic Spatlese and Kabinett to the drier stuff all of these wines make an impression and provide purity and terroir driven character, in particular check out Leitz’s Dragonstone, the Magic Mountain and these Trocken bottlings, like this one, along with the Erste Lage Drachenstein and the GG’s!